Some time ago I had read Milestones: The Story of WordPress book by Siobhan McKeown. It is a charming and detailed tale of WordPress history. But more than historical detail I had enjoyed a theme of cultural fit and its importance. It is often hard to distinguish what WordPress cultural values are precisely. We are different, we argue, we disagree, but there is some foundation of principles that did shape it as a project. What does that vague call stands for? Democratize publishing by empowering people to create sites quickly and easily. It empowers people not only to publish easily (long possible with hosted services), but to do it on their own terms. In their very own corner of the Internet. However self–hosted site is far from trivial. You need to know things. Yes, sometimes such nerdy things like what PHP version you are on. Otherwise… you and your visitors are going to have a bad time. Democratize publishing by empowering people to create sites quickly, easily, and without a clue. They don’t have to care. WordPress enables millions of sites to be created. And it denies that their owners need technical knowledge and bear technical responsibility for their operation. Wait, let me rephrase. Is that a right thing? Wait, let me rephrase. Does that make Internet better or worse? This is surprisingly hard to answer. It surely resonates with explosive growth of Internet as a whole. It surely seems to validate WordPress success, as typically measured by popularity alone. It makes more of Internet. And more of the same. More of the slow, broken, hard to read, poorly accessible, and insecure. And if you don’t want to — that is perfectly fine. Go get yourself a Medium account or something. Dot com is primarily honest straightforward hosted solution. As many before and after it. Managed WP hosts are mostly a marketing spin (in my opinion), they add value with specific WP expertise, but the woes of running a site are still owner’s. The nuance of dot org is that it pretends to be self–hosted, while sweeping many implications of such under the rug. 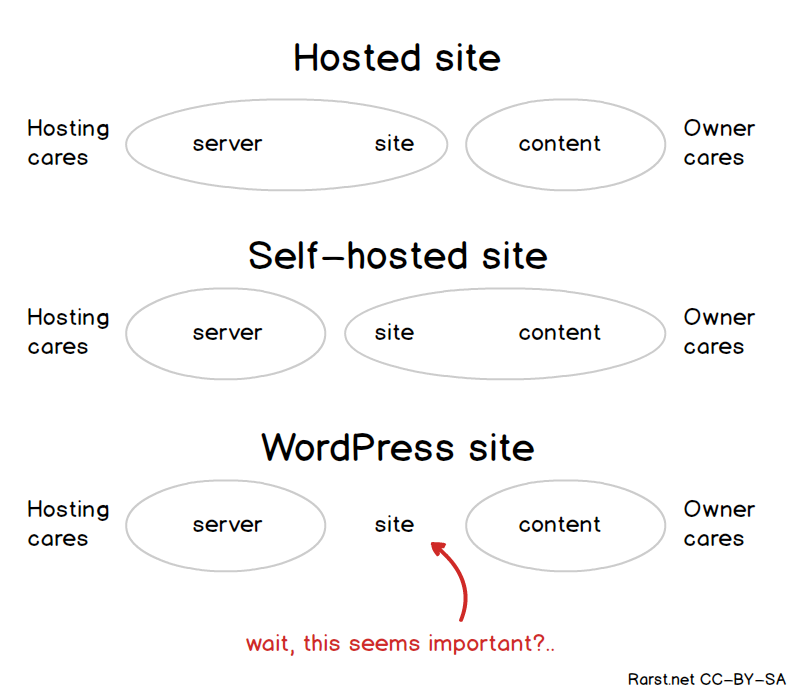 The benefits of using self–hosted WP are real and awesome, but no amount of application logic can magic away the inherent challenges of self–hosted site. This worked better back in the day when people who purchased hosting knew a little bit more about what they were doing. The value now is to provide lessons to naive website/business operators and people who need to be “right”. One of the great challenges of current situation is that education is failing to catch up with the scale. Yes, there are people who strive both for knowledge and responsibility in WordPress. There are bright developers and companies on whom much of this all hangs. But in perspective they are anomalies, accidental rare sparks in giant crowd. WordPress grows, but at some point is also has to grow up. I don’t think this is particularly a WordPress problem, and I’m not saying that just because I love WordPress. Education and getting people to understand that they need to take some responsibility has been a problem almost since the inception of the web, and it rears its head in web accessibility, security, and building websites with or without a CMS. Official WordPress could preach about how people need to be educated until it’s blue in the face, and it wouldn’t make a bit of difference. Trust me, accessibility does this, and we’re not only not winning in that arena, we’re losing. By no means this is exclusive to WordPress. But I think it’s fair to say no other single solution took this to a scale that WordPress did. No other solution is so adamant about “protecting” site owners from pesky technical knowledge. Sure, WP would not fix a web overnight by trying to educate. However actively shunning education and knowledge is surely not helping the issues. I’ve long since belived WordPress was shooting itself in the foot with the “it’s so easy anybody can do it”. Ease of initial use and basic development (to a degree which tinkering with theme templates is development) is very strong feature of WP. Unfortunately there is more to development than that. Creating complex involved solutions is just as hard in WP, made harder by culture of continued obsolete PHP use. I am not much irked by “WP is easy”, but I am very aware that in many ways ease of WP can hold one’s development skills back. I started get solid progress as a developer once I started to make targeted effort to learn PHP outside of WP bubble. Nice article and good read. True that WP is ever updating keep pace with languages like jQuery or PHP. However, with this speed, users do not move and they hardly act unless until their site goes down or behave weirdly. By auto system WP does gives notifications of updates but most admins avoid this simply reasons? Either their sites have been designed by someone else and he/she will charge again to update those software or the sites are heavily customized and they know that some thing will break if they update WP. So to me, I think whoever builds a site on WP – by themselves or by someone else, should know something about the software and underlying importance of updating software. It’s something like you’re still using IE 6 and then complains that this does not play nice there. It’s a digital world. So, if you have a phone or a computer, you know also know something how to run this. This will suffice I think. For others, they can easily hire someone and fix this. I don’t see WP keeping up with PHP at all. PHP had been making major progress in language and ecosystem in recent years. WP keeps growing “wide”, by inflating and complicating its monolithic core and largely ignoring modern PHP. You are analogies with software updates in other contexts are somewhat on point. Though I think using modern desktop OS is much less technically involved than self–hosting a site. Still there are certain expectations in either case and I think WP is grossly overselling itself and its capability to make those not matter. It’s hard to make site owners understand, recently i came across a custom plugin that was still using mysql_select and mysql_query to run queries on the database. The hosts updated the PHP version, apparently no notice was sent to the owners(or they were ignored). We updated the code to do it the WordPress way. At the end of it all, we got the plugin functional but were asked the question of what were the exact changes, since after all the plugin does the same thing it always did. This is sort of the point. Yes, self–hosting is hard. But being hard doesn’t make it unnecessary. Also it wasn’t the point of this post, but keeping focus on old PHP keeps back developers. Why was that plugin using old queries? Did its developer know they should update the code at some point? Did they care? And so on. It’s the self-publishing aspect of WordPress that seems to be the problem. It’s a step above simple social media platforms but enough above them that a learning curve exists and so a front end provider is pretty much necessary. I believe WordPress is popular because its the favorite choice of front end providers (read pushers). After all it is a well organized framework with a friendly UI. WordPress makes it easier for providers to distribute websites to their small business customers. That is why I use it for my customers’ websites. Regardless of the budget, I can provide a website solution. So the small business doesn’t need to be learned or awash with marketing dollars to have (and sort-of administer) a web presence that is not fb. WordPress to me means Democratize in the Walmart way: “Online publishing to which even the poor can have access.” It allows any small business to have the appearance of being independent and rich enough to have a real web presence – the status of owning a real website. And why not? If the wealthy companies can have a web presence, why can’t the not-so-wealthy? WordPress is a company that the elite love to hate. Just like Walmart. But if it were not for providers like them, with all of their short comings, the every-man would not be serviced. Having said that, we still need to hold WordPress to the fire, otherwise who is going to stand up for the every-man? And for that, I thank you. I think you grasp very well what WordPress grasped very well — the affordable initial cost of setting up [simple] self–hosted media presence. What WordPress glosses over is ongoing cost. Maintenance, keeping up with tech, and growing with the needs of the business. Self–hosting is more challenging and does cost more resources. In some ways WP can mitigate it, in others it cannot. But its narrative is incredibly fuzzy on when former ends and latter starts. I was a PHP coder before WP was much of anything. When first exposed to it, I loved taking advantage of plugins like most coders would a Library. I mean, how many times do I have to re-invent the wheel? My main complaints now about WordPress now are related to its many redundant functions related to backwards compatibility. Also now that I have more sites than I can remember, when new updates come out… so many sites to update! Caching ought to be baked into the system as well. WP gets knocked by some who only know the reputation it has when people use stolen or outdated themes and plugins. When I’m doing sales pitches and the subject is WP I always talk about the awesome ease of use for non-power users, a manageable GUI admin, and the many highend sites running WP in the backend. Also the Spam Filter comment system could stand to be, I don’t know, more automized? It also bothers me that a blank index.html is not included in every system directory. I don’t think it’s productive of WP to assume that critique comes only/mostly out of ignorance. That hugely contributes to its bubble of people just not willing to listen to any critique. It’s easy to blame plugins… But plugins don’t grow on trees. They are developed by WP’s own community, to a standards and practices of that community. Which are often more focused on looking backwards to PHP 5.2 than forward to modern PHP and learning what that means. That is surely something to ponder then. :) WordPress is immensely cultural project in different ways. It is a good question to ask – Does WordPress make Internet better or worse?I totally agree with the answer you provide – It makes more of the slow, broken, hard to read, poorly accessible, and insecure Internet. I believe that it is a commonplace for the web, mobile and software development industry on the whole. Take closer a look at app development – 94% of all app store come from 1% of all publishers, according to the latest reports. And the matter is not in the fact that there are few good and professional developers, but because there are so many amateurs who swarm the market with their low-quality products. That is why many turn to enterprise development, like here, or some other spheres like VR, which is growing fast. So, yes, we are responsible. There is no one to blame for the poor quality of the web and app market but ourselves.